When “First Light” dropped at the beginning of the year, it felt like Django Django was going to abandon guitars in favor of an extended dance party atop the recently toppled 1980’s retro bandwagon. That amiable bit of chintz turns out to be an anomaly on Born Under Saturn, a careful refinement of their neo-psychedelic rock abilities. “Beginning to Fade” molds delicate folktronica and Vincent Neff’s beautiful baroque pop vocal harmonizing in a way that hasn’t been heard since… wouldn’t you know it? Django Django’s drummer/producer David Maclean is the brother of The Beta Band’s sample-meister John Maclean. “Pause Repeat” and “Life We Know” are delightful reminders of that moment in music history when the flower power generation “discovered” Afrobeat. “Shot Down,” like “First Light,” is an escapist disco interlude, with darker hued synths providing subtle naughtiness. Born Under Saturn runs nearly an hour, and though there aren’t any tracks that we feel should have been cut, at least half of them could have increased their potency with pruning. “Giant” lives up to its title thanks in part to some regal piano chords, but that still doesn’t justify the six minute length. “Found You” could have faded out as Tommy Grace’s organ transitioned from an engagingly creepy carnival refrain to mere noodling. 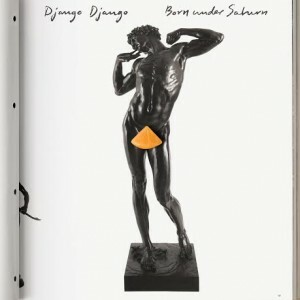 Django Django has an impressive collection of quality song formulas at their disposal. If they delivered a little bit less of each of them at a time, it would leave us wanting much more.